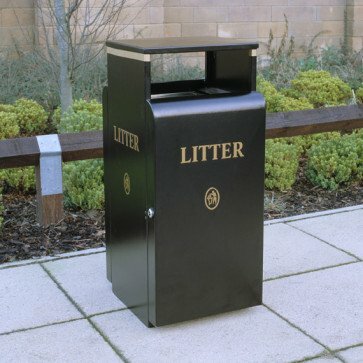 Our valley 100 waste bin is our best selling Bin and is ideally suited to are public area. All Valley bins are manufactured in 2mm mild steel and treated with a rust resistant primer prior to coating for extra durability.The Valley range offer excellent corrosion resistance. Fitted with a slam lock and internal litter guides the Valley 100 is available in a Black gloss as standard. Additional colour finished of Cobalt Blue, Forest Green and Matt Black are available as special orders. Please contact our sales team for assistance for special orders.